I read Wildwood Dancing, by Juliet Marillier, because another book blogger (whose blog I can’t find anymore…woops…) said it was one of her favorite books of all time. It was published in 2007, but I had never heard of it before a few weeks ago. I looked it up on goodreads.com and decided it was a good time for a fairy tale style book. And I was right. I devoured this book. Lost sleep over it, in fact. This is the first book I have read by Marillier, and I’m already onto my second. 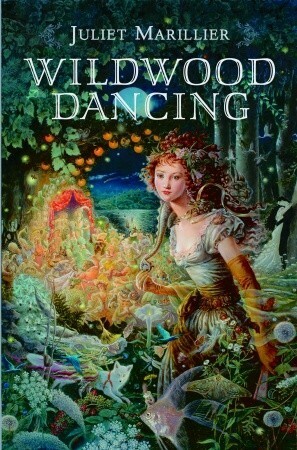 Wildwood Dancing is loosely based on the Twelve Dancing Princesses fairy tale, with many changes and additions. Set in Transylvania, in a castle in the fabled Wildwood, the book opens on a family of five daughters saying goodbye to their father for the winter. He must leave for better climates due to health concerns. He leaves Jena, his second eldest daughter, in charge of the family and family merchant business. In a time when women were not considered worthy of much education, Jena’s father goes against the grain in allowing his daughters as many educational opportunities as possible in a small village setting. Jena and her sisters, Tatiana, Paula, Iulia, and Stela, are saddened by their father’s departure, but they are cheered by a secret they have long shared: they have a portal to the Other Kingdom. What is the Other Kingdom? It’s where the fantasy characters of fairy tales live–dwarves, trolls, fairies, and many other non-human beings. Every full moon, Jena and her sisters are able to access the portal into the Other Kingdom for the dance held at full moon. They do not wear out shoes, but they do have secret stashes of ball gowns. This arrangement seems perfect, but there is a darkness hovering over the family related to the Wildwood. As a little girl, Jena and her two cousins, Costi and Cezar, experience a tragedy that changes the courses of their lives more than they realize. The darkness deepens when the Night People come to the forest. The Night People resemble vampires, but they are not exactly the same. The book is set before Bram Stoker’s Dracula was published, and I really admire Marillier for knowing her history on this one and going back to the original folklore. Jena’s family becomes entangled with the Night People and disasters in the village make Cezar, Jena’s power hungry and vengeful cousin and neighbor, suspicious and enraged. It’s up to Jena and her sisters to put to rights all that has been upset between the Other Kingdom and the world in which they live. Unlike some fairy tale re-tellings, Wildwood Dancing becomes an intricate story in the hands of Juliet Marillier. She makes more lively and lifelike characters, researches thoroughly the area where the novel is set, and teaches readers Romanian words along the way. The additions of a magical pet frog, cunning or charming non-humans as dancing partners for the sisters, and smart and educated “princesses” (really merchant daughters) transform the Twelve Dancing Princesses into a riveting tale. This is a book I stayed up late to finish. It is fanciful and fun. I would add it to my list of Great Books for Teenage Girls, and recommend it to anyone who likes a fun fairy tale story. I’m currently reading the companion novel, Cybele’s Secret, which so far is not quite as good, but still a fun read. And if you’re wondering if I’ve become a Young Adult fiction or fantasy junkie, rest assured–I have not. My next review will be of the 1927 release Islanders by Helen R. Hull. So stay tuned for a more serious book review in the next few days.